Gabriel, a beloved and influential St. Louis disc jockey whose exuberant personality and passion for blues and gospel entertained radio audiences from the 1950s to the present, died at Mercy Hospital South (formerly St. Anthony’s) on October 19. He was 88. A mainstay on KDHX (88.1 FM), he hosted Gabriel's Tin Pan Alley every late-night Sunday (technically midnight to 3 a.m. on Monday mornings) for decades. The program began each week with the strains of Strauss’s “Also sprach Zarathustra" and a sampled voice declaring, “The man. I mean the man! The sensational! The incomparable! The king of the blues! The dynamic! Gabriel!” His playlists knew no bounds save those of the soul. He segued effortlessly (and sometimes perversely) from James Brown into Sunnyland Slim into Roy Acuff. Doo-wop? Boogie-woogie? Rock & roll? Western swing? Swamp pop? TV sitcom novelties? The holy blues (as he memorably called gospel music)? He played it all. His knowledge of American music was encyclopedic and his joy in sharing it irrepressible. Gabriel was born Mitchell Hearns in Louisiana in 1930, but grew up in East St. Louis, where he attended Lincoln High School at the same time as Miles Davis. Both learned to play the trumpet there. In East St. Louis, he came to know and worked with many of the legends of rhythm and blues, both regional and national, including a significant relationship with Ike Turner. 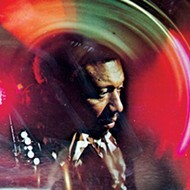 In 1958, he released “Boxtop” by Turner on his own Tune Town label. Copies are among the holy grails of rhythm and blues, as it was the first recording of Tina Turner (under the name Little Ann). 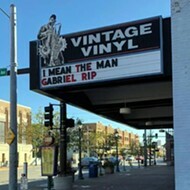 Gabriel owned a record store in St. Louis called the House of the Blues and had his own recording and performing career, releasing singles under various names — “The Flock-Rocker,” “Gabriel, His Trumpet and Band of Angels,” and “Gabriel & the Angels” — on which he often played trumpet and was sometimes backed by Ike Turner’s band and legendary St. Louis guitarist Bennie Smith. According to the St. Louis Radio Hall of Fame, his career in radio began in 1952 with WOKZ in Alton, Illinois, and then WTMV in East St. Louis and KATZ, where he held down a five-hour Sunday night/Monday morning slot through the late ‘60s. He loved to joke with and quiz his audience. (“I don’t want to know the name of the song,” he’d say. “I want to know the singer.”) In 1969, he quit the station after a programming change. 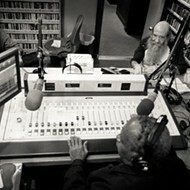 In the early ‘70s, Gabriel was part of KDNA, the short-lived, community-supported precursor to KDHX, and began broadcasting on 88.1 FM in 1989, two years after its launch. He influenced every DJ on the station (including this writer), many of whom remember him fondly. A June 2010 fire ravaged his East St. Louis home, destroying many irreplaceable records from the collection that formed the basis for his radio show. A benefit that summer at BB’s Jazz, Blues and Soups featured local blues legends Marquise Knox, the Arthur Williams Band and Silver Cloud. He continued spinning delightfully unpredictable music on Gabriel’s Tin Pan Alley right up until the weeks before his passing, but it was the force of his spirit, his way of connecting with an audience that kept listeners returning. On-air he would read letters written by prisoners, recognize births and deaths, and give shout-outs by name to all-night truck drivers, cabbies and veterans. “Gabriel was a shining example of something no longer heard on commercial radio,” says Tom Ray, host of the long-running Soul Selector program on KDHX. “He was a singular, regional eccentric personality, given to free-form programming, instead of rigid playlists with no more than 70 or 80 songs for an entire week. 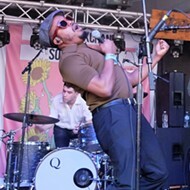 Gabriel's roots go back to the 1950s and even before that; he was witness to the sort of rhythm and blues music in the late ‘40s that a few years later was tagged 'rock & roll.' For Mr. Hearns, the likes of Motown was too pop, a shiny product with the raw blues and gospel rinsed away. Gabriel pre-dated black radio's ascendancy in the 1960s, harking back to when a strict playbook had not been written.